There has never been a day when I have not been proud of you, I said to my son, though some days I'm louder about other stuff so it's easy to miss that. Another cute project from Zack's preschool (which ends in a few weeks, much to my dismay -- it's been SO good for him). "Swimasaurus Fast Speed: He lives in the ocean. He is a plant eater and he eats seaweed. He wins all the races because he's really fast. His big tail swishes and helps him go fast. He sleeps on the sand." I think Swimasaurus is pretty cool! You can read the last installment of my series in metalsmithing at Watch Me Create by clicking here. I write about how I made my Insomnia Talisman, pictured below. Zack loves swimming. He's not so sure about soccer. He loves the practice, likes running around, but when it's a whole herd of kids racing after the ball, he's more apt to decide he's had enough. And I guess I qualify as the above, at least for the next four weeks (good thing I sold this bracelet already!). This past week was Transportation Week at Zack's preschool. They brought in boxes and painted them and cut the bottoms out so they could walk around and pretend they were driving the cars. Zack brought his home today and decided it could be anything he wanted it to be. He decided he was watching TV while on his boat, tooting the fog horn to warn other boats to get out of the way. Notice the ten car pile up in front of his boat. Too cute for words, right? I've been slowly but surely acquiring new art for the walls. At first I was just methodically collecting pieces for my office, but now I'm replacing more and more things in the house. My goal is to have a large collection of eclectic beauties that are created by artists by hand, not mass produced. As much as I love some of the prints I've purchased at IKEA, it's time for a change! My most recent find is an incredible mixed media work by Kerry Bogert. I've fell in love with it the minute I saw it on Kerry's blog, before it was even for sale. And when I found out she'd put it in her Etsy shop -- oh man. She has others for sale, so it took me a while to decide -- the green/blue, or the pink/red? I finally decided on this one, as it had such soothing colors and just spoke to me in a different way. I'm eagerly awaiting more from her, because I'm certain it won't be the last one I buy. 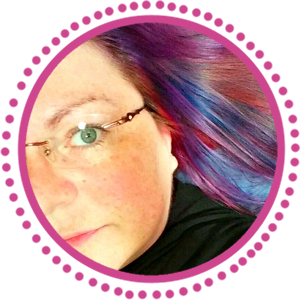 You can see more of Kerry's work at her Etsy store, and be sure to check our her whimsical lampwork and wire jewelry by clicking here. I got a kilo of happiness in the mail today! No no no. Not that kind of kilo. Although it did come from a tropical island! 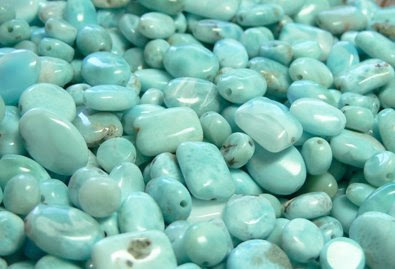 If you've visited my web site or read this blog, you know that I love, love, LOVE larimar. Larimar is a rare blue gemstone found in only one square kilometer of the world -- in the Dominican Republic. Larimar is a volcanic rock, and since it's in such a limited area, it won't be around forever. It's not often that you find jewelry made with larimar beads. 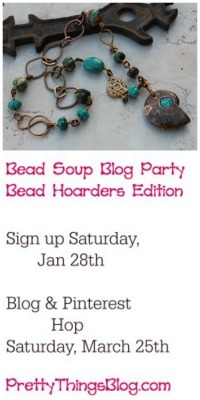 There's a lot of wasted stone when cutting beads, so it makes sense that they aren't readily available. I feel lucky to have a source. The other day I emailed my supplier and asked if any beads had come in (last time I'd asked, in February, he'd said there wouldn't be any until September, but I figured there was no harm in asking). He said no, and he doubted there would be any at all until late next year. Panic mode. No no no. And then Divine Intervention -- it must have been. Because he said, "Oh wait. I do have a kilo sitting here of all random beads that never made it onto strands. You want 'em?" Heck yes I wanted them. Three days later, FedEx arrived, and I poured them out into a big serving bowl. Aaaaaaaah. I don't know why, but I dearly love to sort beads. So not only is this a mega mother lode of larimar beads, but I get to sort and string and weigh and it will be an enormous pleasure. However, I'm not looking at my credit card bill for a while. The craft show was a great success! Even with a smaller number of artisans, it went quite well for me -- I've got some really incredible customers in Virginia Beach. I've got one private event this month, and no other shows until the St. Michaels, MD, Strawberry Fest June 7, so I'll finally have time to update the web site with a lot of bright, summery jewelry! Exquisite and HUGE larimar pendant on a long Bali bead necklace. This is the largest larimar pendant I've ever worked with, and the most expensive necklace I've ever made. 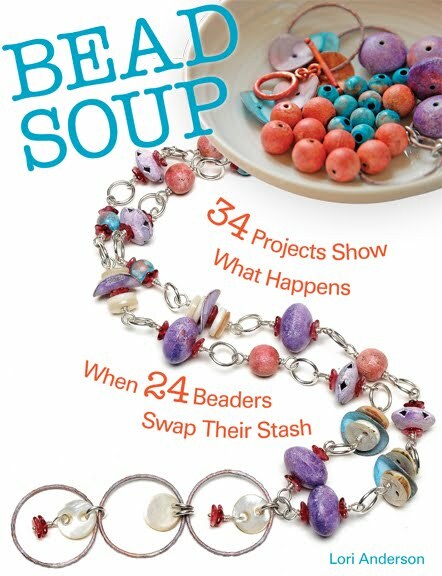 Aptly named "Better Than Prozac", this cheerful necklace is made out of handmade lampwork beads -- 125 of them, to be exact! It sold in the first two hours of Friday, and the woman who bought it wore it out of the booth, and came back later to say she was constantly stopped and asked where in the world she got it. I was sad to see it go (I so loved it!) but it couldn't have gone to a nicer person. This dramatic piece went to one of my best customers and a terrific friend. Two strands of amethyst and a strand of pearls frame a large Tibetan silver pendant -- a gorgeous showpiece. This bracelet is made with handmade lampwork glass I picked up at a bead store while taking a class with Stephanie Sersich and I immediately knew they had to go into this chain maille bracelet. I made the chain, but the name keeps escaping me. I'll remember it..... later. This one was waiting for just the right person who could carry it off -- and it looked stunning on her. It has a lot going on and it is so pretty, especially in person when you can see it glitter and hear it as it moves. Handmade lampwork beads, rose quartz, Swarovski crystal, vintage lucite, cubic zirconia, Bali silver, and a handmade PMC clasp by Joanie Croyder. I'll have new things on the web site, http://www.lorianderson.net/, very very soon! 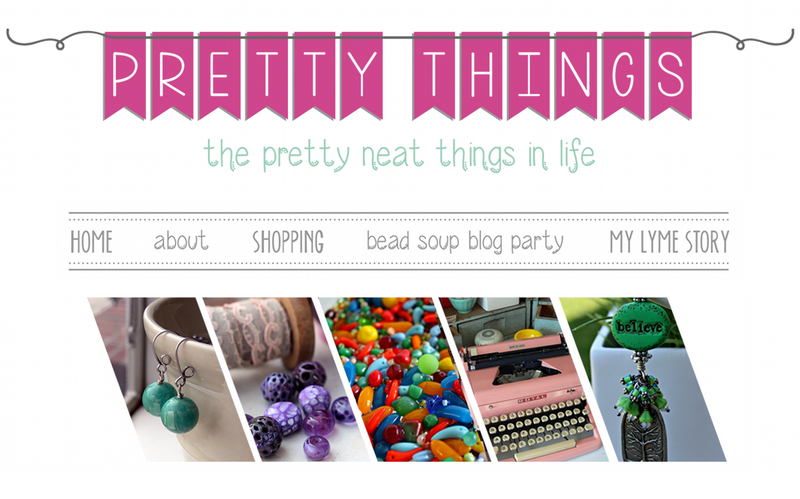 So please keep checking it, clicking the What's New link for the newest creations, and thanks for reading the blog! You can read Part Two of "Adventures in Metalsmithing -- Going Green" at Watch Me Create by clicking here. You'll see one of my attempts at bezel-setting a large pendant, and read about how my instructor teaches silversmithing with "green" in mind. "You're never going to get through the weekend if I don't do this right NOW." Had an emergency root canal today. Holy Mother of God. I couldn't figure out which tooth exactly it was, since I had a filling in two teeth and in between the teeth (back molars) and I thought the filling was crumbling or getting ready to fall out. So he said, "You're going to hate me, but I'm going to blast some air on one to see if that's it" (another thing you don't want to hear a dentist say -- "You're going to hate me"). Well, I quickly figured out what tooth it was. After he peeled me off the ceiling, I got my heart rate back down, and he said, "Ok then, let's get you numb". That's when I asked, what, you doing this NOW? And he said the you-won't-get-through-the-weekend part. Four shots of novocaine. He warns me that this is a "hot" tooth, meaning it's entirely likely that while he's drilling, he'll hit a nerve and I'll feel it and he'll have to shoot me up again. Starts drilling -- yup. Not fifteen seconds in and I'm back on the ceiling. He shoots me up twice more and leaves for a while to let that set in. Comes back, starts, I'm still feeling it but I'm merely digging holes in the armrests; I haven't levitated yet. So he drills, shoots, drills, shoots, drills, etc etc, and finally, nerve is gone. All done, and I finally remember to breathe. If you love to knit, want gorgeous rovings for felting, or have been dying to find cool sock yarn, The Fiber Gourmet is a terrific online store to visit. Everything is kettle-dyed or hand-painted, so you know you won't find these in some Big Box store somewhere! Even the names are yummy -- Lemon Blueberry Bars Garnished with a Wedge of Lime is shown! Check her store on Etsy out by clicking here. So new it's not even on the site yet.... larimar anklet, bronze and bright purple, clusters of flowers for your ears, and amazonite, smoky quartz, and a single lampwork bead to ooh and aah over. See more at www.lorianderson.net -- indie artisan jewelry! I swear I've been making jewelry. Tons of it. It's just been selling at shows before it ever gets to the web site. So this weekend I'm working on updating the web site as much as I possibly can, so you won't think I've been lazing around doing my nails all day (seriously, have you SEEN my nails?). I filled up the camera's memory card with photos, and am now busy with Photoshop and my web program, then tying on price tags (I still need to show you the new ones, they rock), and in between all that, running around every five minutes doing something with Zack. Play this game, read this book, do this craft -- I run this business so I can BE a full-time mom. And I don't ever forget that. It's been a while, yikes! Last weekend, I had a three-day show in Chantilly, VA, at the Dulles Expo Center. It was my first time exhibiting with Gilmore Enterprises, who are constantly rated in the top 100 in Sunshine Artist magazine (and several are in the top 20). I was thrilled to be there, as it took four years of trying to finally be accepted. I've always equated being accepted to juried shows as applying to college -- you send in four to five slides representative of your work, an application fee, and wait, and you may be one of fifty jewelry artists hoping for that one slot. Many people have said that a bad Gilmore show is a good show elsewhere, and I have to agree. Many of the artists there said the crowds were down, and spring shows usually are slow -- there's no big holiday to buy for, people are away for spring break, the weather, if it's nice, means people are outside -- but I was busy the entire time. I had brought a couple of jewelry projects with me, anticipating down time, but there really WAS no down time. The one bad thing about a busy show was that I burned the candle at both ends and ended up with a bad cold, so spent almost all this week in bed. And now I'm burning the candle again, updating the web site, photographing jewelry, MAKING jewelry, and getting ready for another three-day show in Virginia Beach in two weeks.